As I peruse the table settings, I look with ease at the red and white checkered table cloths, I review the sailboats, seashells, and candles. Check. Everything is in order. I move into the sanctuary and observe that banners that say, “Sink, Swim, or Set Sail!” Bright blues and reds look stunning against the old cream colored tin. In the kitchen, the Bible study friends have quietly entered the church and are now setting up the lovely tea rings, along with bran muffins, and I breathe in the delicious odor of deep rich coffee brewing. Everything is set. The music is playing softly and I have prayed over every pew. I am ready for the Holy Spirit to reach hearts and minds, and excited as the women begin to enter the church. I hear laughter and small talk from the women as they pick up their folders and check in with Bernadette and Mary. When the morning begins, I press down on the old white ivory keys of the piano, and hear the flood of voices filling the room and I begin to feel that overwhelming happiness that hits me whenever something is happening at the church. Upon stepping behind the pulpit, I am totally aware that in 1900, someone stood in that same spot and looked out at the faces proclaiming the gospel. At times, it makes me feel small, as though I’m no one, so why would God allow me to be doing this now, in this same spot? At other times, I just feel an overwhelming gratitude for all that is happening and all that has happened. Throughout the day, I catch glimpses of women laughing, tearing up, and nodding along to what is being taught. I see the group of women, many from the surrounding communities, hugging one another, encouraging each other and praying together. I am blessed. But as we head to the Cashel Township building (the old schoolhouse) across the street, so that I can teach my workshop, I feel in awe of God. It was just two years ago that Farmer Dean (my husband) and I headed, hand in hand, to the schoolhouse to try to purchase it. The board said they’d discuss it, but we knew it was a no. It was actually okay because after we walked in, I remember that I didn’t feel God’s pleasure. I felt God saying no to me. And now, two years later, here I was standing in the center of the schoolhouse. Blue gingham checkered curtains were at the little windows, while old sturdy oak pews were lined up with women waiting to hear what I had to say about the topic of prayer. I stood there looking at them, fumbling for words since I’d just taught a one-hour lecture a few minutes before. 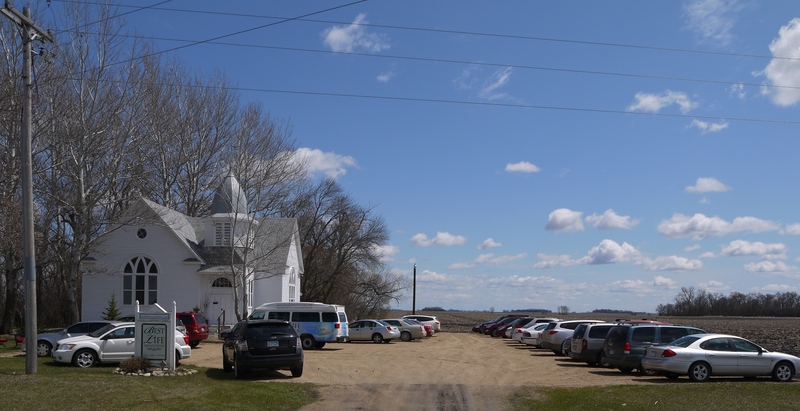 I launched in to what I knew … “I prayed right here in this schoolhouse,” I told them. I prayed for a building to house our ministry and an office to work in. God said no. God said, “This isn’t it, Kathy.” And God handed me a dream on a silver platter 6 weeks later. Formally known as Frank Lake Covenant Church, we found something so much better than the tiny little schoolhouse. 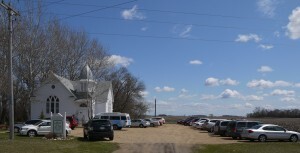 God’s provision of an old rural church that had sat empty for 32 years, was nothing short of a miracle. After I felt booted out of my worship arts ministry position, I tried not to feel bitter. If I had not stepped out with a resignation and walked towards full time nonprofit ministry, I would have missed the opportunity of purchasing a 1900’s church for $1.00 on Craigslist. If my sweet farmer-neighbors had not suggested looking for “an old church” I would have never thought of it. If my sweet husband didn’t have a grove that nothing would grow in, exactly the size of the old church building, I wouldn’t have a place for it. If women weren’t coming to Best Life Ministries conferences, I wouldn’t have a need for a building. BUT … God knew it all, saw it all, orchestrated it all, and loved me enough to bless me … and all of those who have the joy of walking through the sticky door of the old Frank Lake Covenant Church and entering The Church in the Grove, Headquarters for Best Life Ministries. God is good. He’s really, really good.